RC Willey helps you overhaul your entertainment area with this rustic brown 3 piece walnut entertainment center. You will love the look of the distressed wood and antique hardware which finish off this piece perfectly. With drawers and open storage, you will have all the space you need to organize your media devices, store movies and CDs, and display your favorite collectibles. Pop some popcorn and call your friends it's time for movie night! 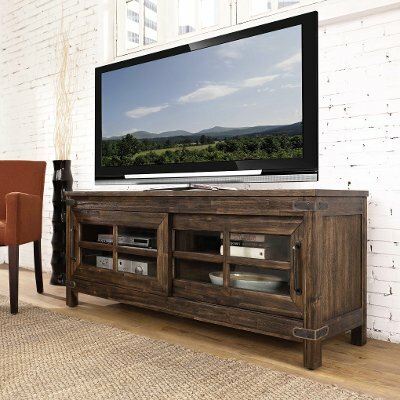 Kick up your feet and enjoy a movie night in front of this 64 inch rustic walnut TV stand. Part of the New Castle collection, this piece is sure to look great in your home. With window frame glass doors, you will have ample space to organize all your media devices. 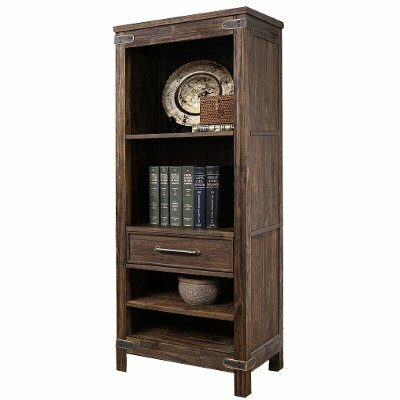 The look of this rustic brown bookcase from RC Willey is just what your home office needs! The distressed wood and antique hardware are the perfect finish for this piece. A drawer to store the clutter and shelves for books and display pieces give a perfect balance to this bookcase. Home office already covered? Add this piece to a bedroom or living room and it will surely be a hit in your home!